These things, diminutive monsters really, are crawling all over a recent canvas by Mick Finch. They’re not actually crawling. They are sort of plopped there each likely arranged and placed and traced left to a hand to paint and fill. The brightly colored bugged gobs recall late-high Matisse-shapes, and remind of those funny places where images are retrieved, the mind, a peculiar storage system, and why, or why not, for any or no particular reason, things are retrieved. And how, sometimes something greater than the mind is able to pull things together to form a web far greater than the mind’s plan itself. The pedigree of the meddlers cannot be mistaken for they are perfect blobs with skeins ands spills, here exoskeleton, though as paint tiny fiords, factures, easy going grooves topographically a record of liquid’s easy sojourn, here isolated from geographical or historical meaning; if we forget the film, lest we forget their beginnings. The bugs, too, can be understood as pond and the canvas as a greater one where bugs wade through. There is not much more here other than color—more of it, less, and its shape. Yet another hand is played messing the ups and downs, the stasis and symmetry of how paint flows and drips when the game plan is changed. For all this the bugs are happy where they find themselves–they sit in a stratagem amidst trails and nets; bugs in chattering dialogue with the next. Mick Finch’s show ‘nevermind‘ is not at all about bugs, but in a sense the strategies are: bugs, in paint, and the images that paint makes–the resource, the outcome, the predicament. 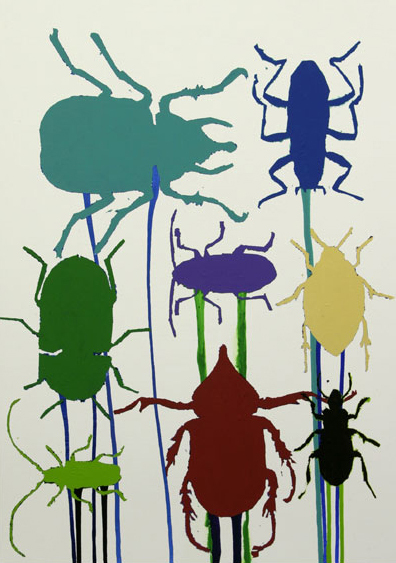 Tags: Bugs in Paint, Color, Image, Mick Finch, Nevermind, Painting, Surface. Bookmark the permalink. Some really interesting stuff on here Brent. Some looks familiar but some is really refreshing.